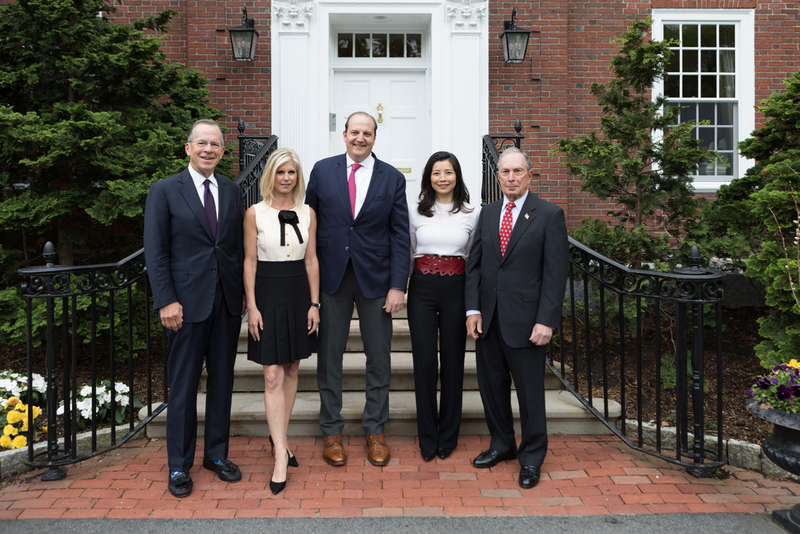 BOSTON—Harvard Business School yesterday conferred its most important honor, the Alumni Achievement Award, on five distinguished graduates as part of the Class Day ceremony for the MBA Class of 2018, who will receive their degrees today at Commencement. This year’s Award recipients are Claudio L. Haddad (12th Owner/President Management Program, 1987) chairman of Insper Institute of Education and Research, a university he helped launch in São Paulo, Brazil; Carla A. Harris (MBA 1987), vice chairman of wealth management and senior client advisor at Morgan Stanley, where she oversees the firm’s multicultural client strategy; Christopher B. Howard (MBA 2003), president of Robert Morris University, a nationally ranked, doctoral-granting institution outside Pittsburgh, Pennsylvania; Abigail P. Johnson (MBA 1988), chairman and CEO of Fidelity Management and Research (FMR) LLC. ; and John A. Paulson (MBA 1980), president of Paulson & Co. Inc., an investment management firm. The mission of Harvard Business School is to educate leaders who make a difference in the world. Every day more than 80,000 HBS graduates strive to make these words a reality in a wide array of organizations that affect the lives of millions of people around the globe. Since 1968, the School has honored a number of outstanding men and women to receive the Alumni Achievement Award. Throughout their careers, these distinguished graduates have contributed significantly to their companies and communities while upholding the highest standards and values in everything they do. As such, they represent the best of the School’s alumni body. Exemplary role models, they inspire all those who aspire to have an impact on both business and society. Claudio L. Haddad is chairman of Insper Institute of Education and Research, a university he helped launch in São Paulo, Brazil. Haddad’s career began in academia and includes serving as director of Brazil’s Central Bank and building Banco Garantia into one of South America’s most prestigious banks before selling it to Credit Suisse First Boston in 1998. Together with a group of Brazilian investors, in 1999 he acquired Insper and has since expanded it into one of Brazil’s leading educational institutions. He holds a BS in mechanical and industrial engineering from the Military Institute of Engineering in Rio de Janeiro, Brazil, and a PhD in business economics from the University of Chicago. Carla A. Harris is vice chairman of wealth management and senior client advisor at Morgan Stanley, overseeing the firm’s multicultural client strategy. During her three decades at Morgan Stanley, she has held positions in mergers and acquisitions and in equity capital markets, where she oversaw the initial public offering of UPS, the largest IPO to date in 1999. Harris, the subject of an HBS case study, is a gospel singer who has produced three albums and performed at Carnegie Hall five times. A sought-after public speaker, she is the author of two books: Expect to Win (2009) and Strategize to Win (2014). She is a graduate of Harvard College, where she studied economics. Christopher B. Howard is president of Robert Morris University, a nationally ranked, doctoral-granting institution outside Pittsburgh, Pennsylvania. A veteran who received a Bronze Star for his service in Afghanistan, he is a former helicopter pilot, intelligence officer, and member of the Joint Special Operations Command. He has worked in the private sector for General Electric and Bristol-Myers Squibb and is founder and former chairman of Impact Young Lives, a nonprofit cultural exchange program for South African students. He previously served as president of Virginia’s Hampden-Sydney College. He holds a BS in political science from the US Air Force Academy and a doctorate in politics from Oxford University, where he was a Rhodes Scholar. Abigail P. Johnson is chairman and CEO of Fidelity Management and Research (FMR) LLC. She is the third generation of her family to lead Fidelity, the privately owned company founded by her grandfather. Her career at the firm began when she was in high school and held a job in the wire room. After college, she worked at Booz Allen Hamilton and then earned her MBA. Joining Fidelity as an equity analyst, she eventually served as president of the asset management, personal and workplace investing, and financial services divisions. In 2013 she was named president of FMR and a year later, CEO. In 2016, she became chairman. She earned a BA in art history from Hobart and William Smith Colleges. John A. Paulson is president of Paulson & Co. Inc. Upon earning his MBA as a Baker Scholar, he spent two years at Boston Consulting Group. He then joined a series of investment firms—Odyssey Partners, Bear Stearns, and Gruss Partners—before launching his own firm in 1994. In 2007, after hedges against subprime credits soared, Paulson & Co. grew to become one of the world’s biggest hedge funds. The New York City native supports cultural and educational endeavors, including the Central Park Conservancy and Harvard’s School of Engineering and Applied Sciences. He holds a BS in finance from New York University.